There are many species of cockroaches, however the most common cockroach in Canada is the German cockroach. Tan with two black stripes and reaching lengths up to 1.7cm, the German cockroach has invaded homes and businesses on an epidemic scale. Cockroaches do not hitchhike on people but instead inside possessions. The first cockroach activity to make its way into a new structure will do so in packages ordered online, suitcases taken on vacation, groceries from the supermarket or furniture that came from another infested home. Cockroaches can even be picked up while moving if the truck used to move your furniture recently moved other infested items. Most buildings suffer from what seems like an endless battle to eliminate their cockroach problem, and while living in a building you can expect to have the occasional run in with a cockroach at some point. While this may seem upsetting there is many steps you can take to protect your home from an infestation. 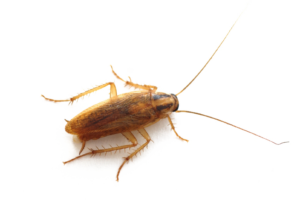 Finding a cockroach in your home is not the end of the world as there is a difference between cockroach activity and a cockroach infestation. Finding the occasional cockroach activity just suggest that there is a nearby problem. Cockroach infestations only develop if your home provides easy access to food or water. These simple steps can help prevent attracting cockroaches and the development of an infestation. CLEAN THOROUGHLY – Washing the floor and counter top to eliminate all visible food sources is a start, however cockroaches will find the small hidden food sources many people miss. Pull your stove out and inspect the side of the stove and also the walls the stove sits between for any grease of food grime that may have spilt during cooking. Cleaning inside and out of the stove, microwave, coffee maker, fryer or any other appliances used for cooking and preparing food. VACUUM EVERYWHERE – Many people eat on the couch and while doing so there is a good chance of crumb falling into the cracks between cushions or on the floor beneath the couch. Be sure to use a handheld vacuum to get deep inside all the folds on your couch to eliminate any food debris within as well as below the couch. WASH THE DISHES, AVOID THE DISHWASHER – Dishwashers provide warm moist and food rich environments that cockroaches love. Cockroaches can squeeze through gaps as small as 3mm and have no problem getting inside the dishwasher and simply running the dishwasher will not eliminate this problem. Washing dishes by hand immediately after use will ensure no dirty dishes left out providing food sources that can encourage nesting behaviour. BE CAUTIOUS WITH PET FOOD – Your pets need food and water also and most pet dishes will sit on the floor. Cockroaches are most active at night so a good practice is to empty and dry your pets water dish and store any uneaten food in a sealed container for the night. TAKE OUT THE TRASH DAILY – Cockroaches are nocturnal and most active at night. Before bed or after dinner take all recycling and garbage outside. If you are unable to do so store all trash in a plastic bag that you can tie tightly to prevent anything from getting in. REDUCE SECONDARY FOOD SOURCES – Makeup, soaps, toothpaste, glues are all things that cockroaches will eat. Reduce cardboard in the home as cardboard is held together using adhesives, clean soap residue from all surfaces, ensure your toothpaste and makeup products are closed at all times not in use. If you discover eggs, droppings, clusters of activity or baby cockroaches this may suggest that you already have a cockroach infestation. If so follow the steps listed above to help quickly resolve the problem. NOTE: While these steps can help prevent an infestation and reduce an ongoing problem, you should still seek help from a licensed pest control company the moment an infestation is discovered or suspected. A pest control technician can provide additional education, look for hidden problems you may have missed and help eliminate the present activity quickly.